Secure the subscription: A secure cloud subscription provides a core foundation upon which subsequent development and deployment activities can be conducted. An engineering team should have the capabilities to deploy and configure security in the subscription including elements such as alerts, ARM policies, RBAC, Security Center policies, JEA, Resource Locks, etc. Likewise, it should be possible to check that all settings are in conformance to a secure baseline. Enable secure development: During the coding and early development stages, developers should have the ability to write secure code and to test the secure configuration of their cloud applications. Just like build verification tests (BVTs), we introduce the concept of security verification tests (SVTs) which can check for security of various resource types in Azure. Integrate security into CICD: Test automation is a core tenet of devops. We emphasize this by providing the ability to run SVTs as part of the VSTS CICD pipeline. 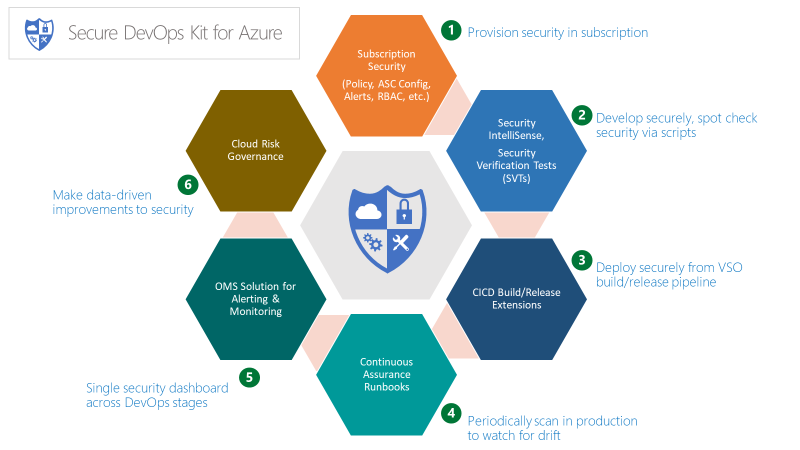 These SVTs can be used to ensure that the target subscription used to deploy a cloud application and the Azure resources the application is built upon are all setup in a secure manner. Alerting & Monitoring: Visibility of security status is important for individual application teams and also for central enterprise teams. We provide solutions that cater to the needs of both. Moreover, the solution spans across all stages of dev ops in effect bridging the gap between the dev team and the ops team from a security standpoint through the single, integrated views it generates.